love to use reuseable grocery bags. The thin ones from the market aren’t sturdy enough to last. They also don’t wash well and the handles break. I’ve wanted to make a set of matching reuseable and washable shopping bags for the longest time. When I was contacted to try the Americana Multi-Surface Paint line I had the perfect opportunity to get my green game on! 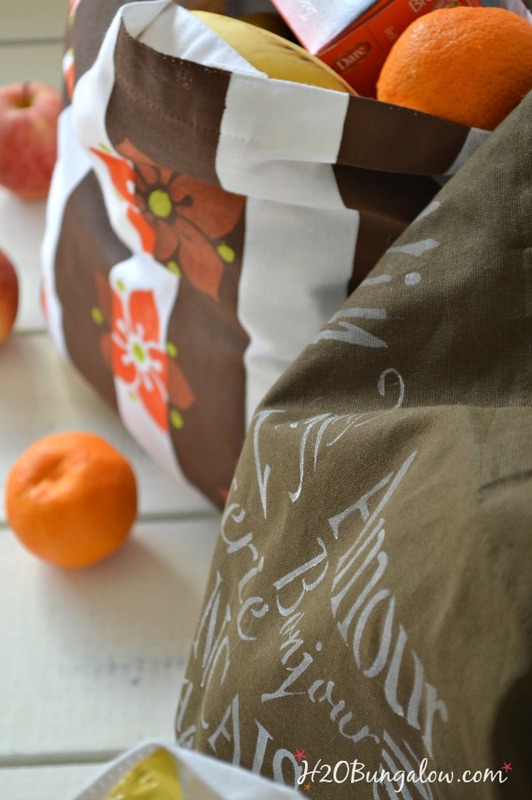 I made a set of Parisian reuseable washable DIY grocery bags that are so cute, they make me want to go to market just to use them. Which is huge in my world! Can I tell you how fun and happy these bags are? 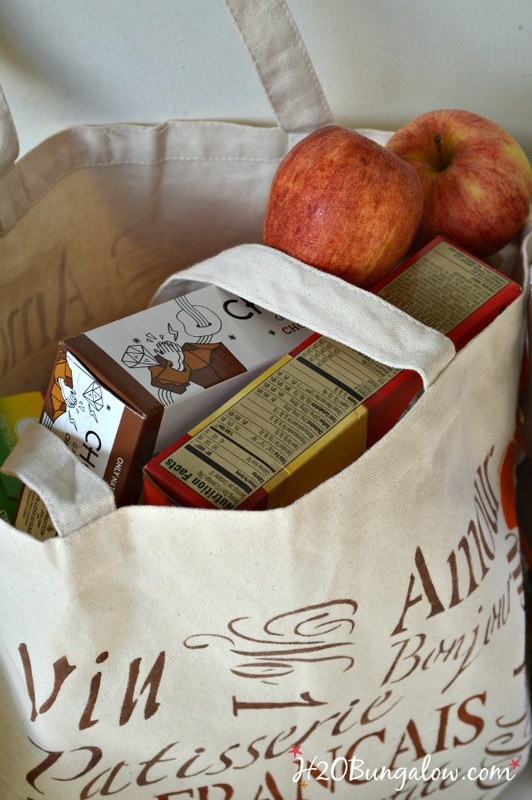 They are packed with practical features that make my job of carrying groceries into the house easier. The handles are long enough to go over my shoulder, they hold much more than the thin plastic bags and they don’t break. Probably my favorite feature is that I can wash them and keep them clean. 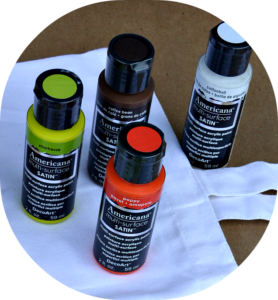 I used the new Americana Multi-Surface acrylic paint for this project. This paint was easy to work with and had good coverage. I love the idea of a paint that works on all surfaces which means I’m not stuck with a craft paint that is only good for one purpose. I’m already thinking of other surfaces I can use this paint on like, wood, metal, glass and terra cotta to name a few. This is what I used to make my reuseable washable DIY grocery bags. 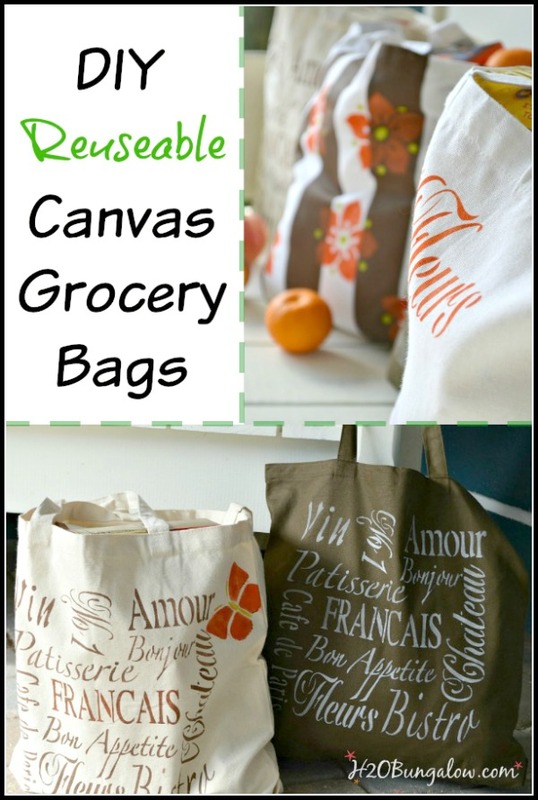 Blank canvas totes, click on the link to find the ones I used. I started by placing the cardboard inside the canvas bag. It protected the other side and gave me a good flat surface to stencil on. I mixed and matched some of the stencils on the bags. 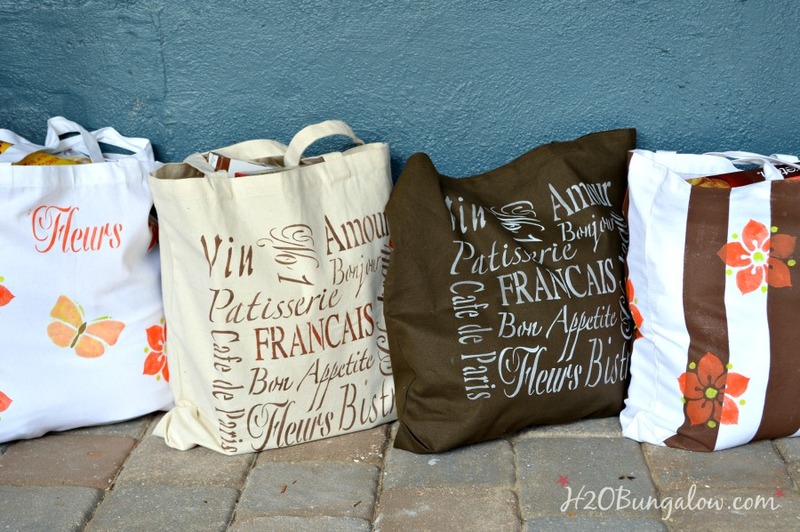 I wanted to make my set of Parisian reuseable washable DIY grocery bags to compliment each other, but not be matchy-matchy. 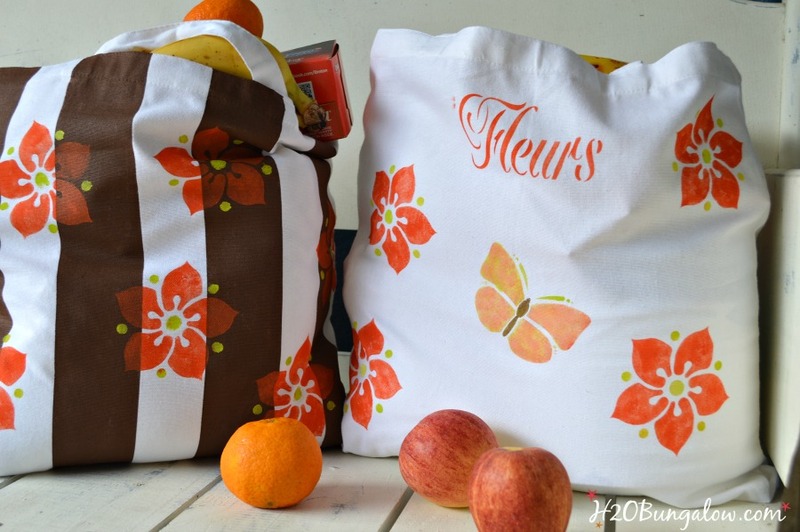 For example, on one bag I used the “Fleurs” word from the French stencil set and the butterfly and flower from the other stencil. On another I painted brown stripes and then added the flowers on top of the stripes. You get the idea…just mix and match. Stenciling the canvas bags was easy. I held the small flower stencil in place with my hand. 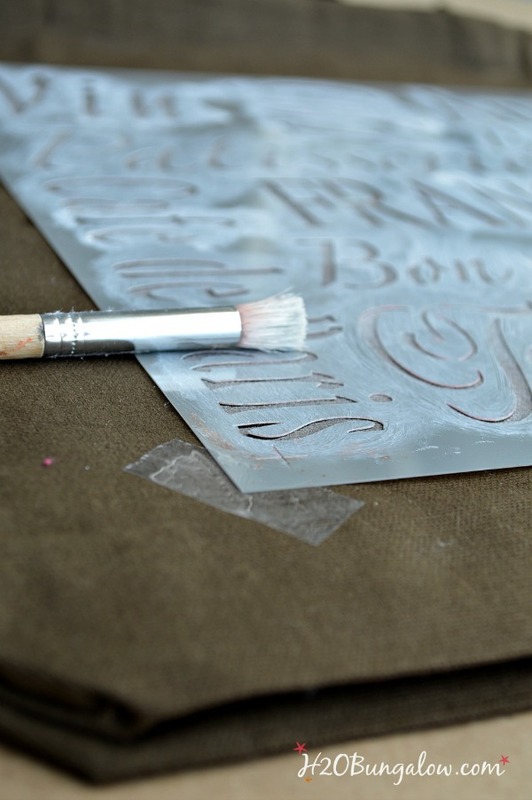 The trick to stenciling is not to overload your brush. I poured a small amount of paint onto a paper plate and dabbed just the tip of the brush in the paint. 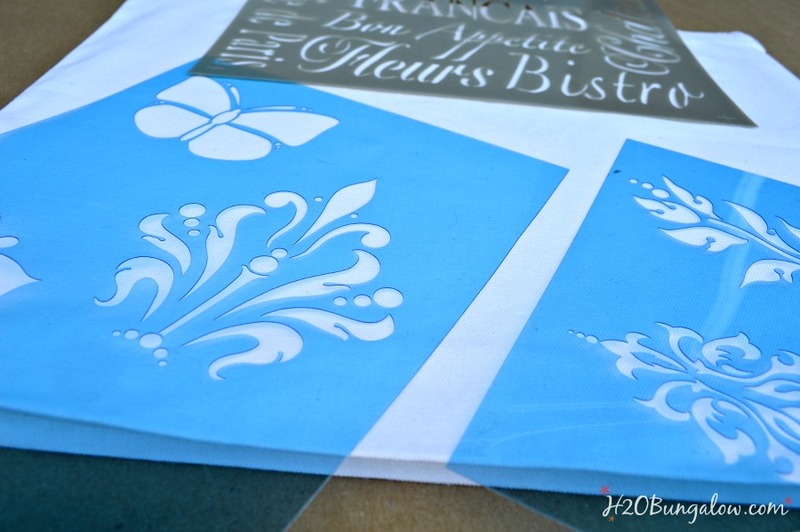 Stenciling works best when the brush has less paint. 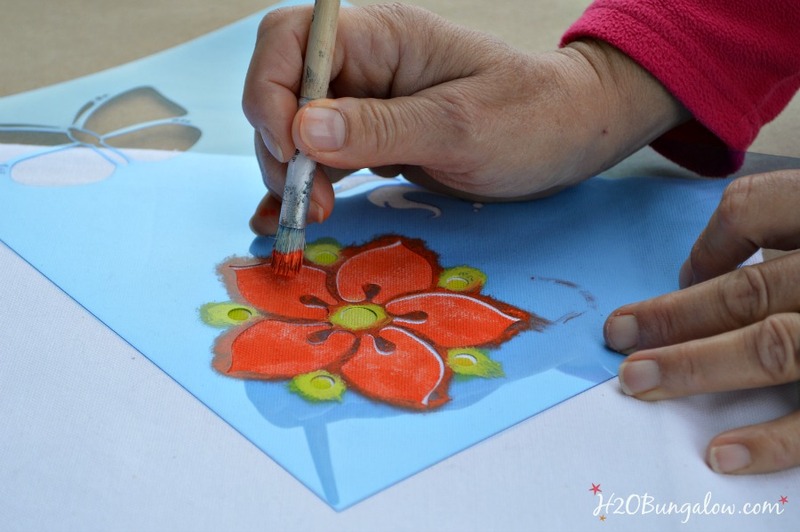 It’s easy to tap off excess paint onto a paper towel. I just pounced the brush down and worked the paint into the fabric. The Multi-Surface paints were a good consistency for stenciling on the fabric. Not too thin, not too thick and had good coverage. I used plain ol clear tape to hold the large stencil in place. It worked great. The stripes on the bag below were made with wide Frog tape. My How To Easily Paint Stripes Tutorial explains my simple stripe method. Once it was dry, I stenciled the orange and green flowers on top of the stripes. Per the instructions on the Multi-Surface paint, I let the paint air cure for seven days. After curing, I set the paint by running a dry iron over the painted surfaces. 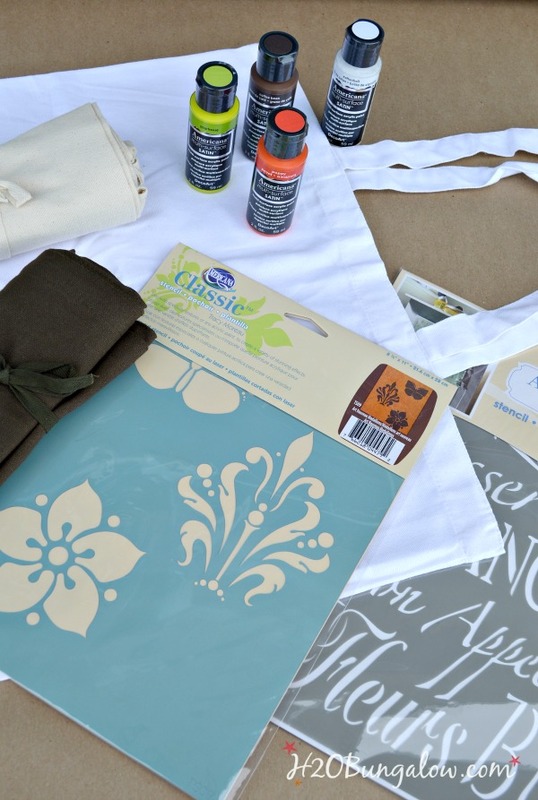 Be sure to put a thin cloth in between your iron and your canvas shopping tote. These bags are awesome and hold a lot! Our son just left to go back to college a week ago. The kid can eat a lot! Since he left, the amount of food we need dropped dramatically. Like in half! These 4 large bags will be all I need for a trip to the market for my husband and I for the next several months. 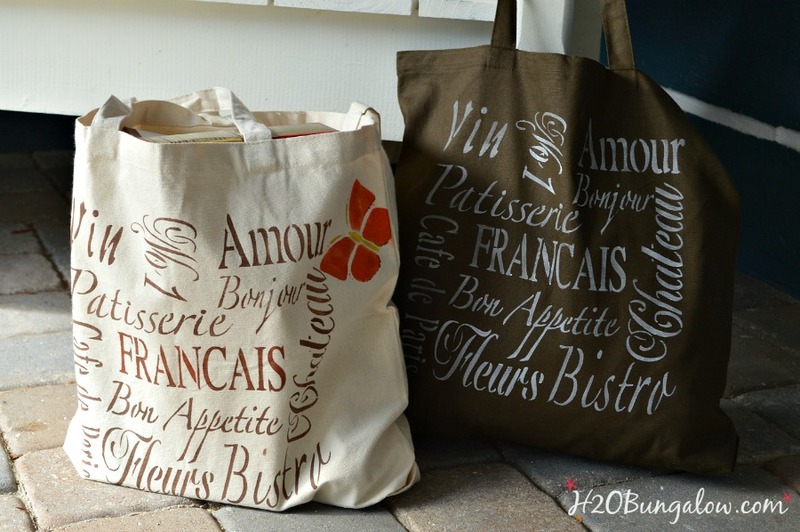 My Parisian reusable washable grocery bags are so much nicer than my old mismatched reuseable ones I was using. They are definitely much greener and better looking than the tons of plastic bags it takes to hold the items from a weekly trip to the market. So…which bag is your favorite? As you might have guessed this is a sponsored post, I was provided product and or compensated for sharing this information. All opinions, craftiness, and projects are 100% my own and never for sale. I’ll only share items I think have value for my readers! I know this is an old post, but I’m curious if you could update how the paint is holding up after all this time? Hi Lisa, I’d be happy to. Your question is a good one. I’m thrilled they have held up well through several washings. I ususally wash them inside out and in warm or cold water. I flaten them out & air dry them. So far they look as good as when I first made them. Thanks so much for your good question & please share a picture on my H2Obungalow Facebook page if you make a set! Thanks so much for the feedback! I will definitely try out the bags, but I had a canvas bag lying around that I wanted to paint so I am happy to hear yours is holding up! You are welcome! I’m like you, and want to be sure something will last before I invest my time into making it. Have fun! Where did you buy the canvas bags or did you make them? What are the dimensions ? Hi Donna, Those are good questions! I bought mine at JoAnn Fabrics, but right after that they stopped carrying the heavy canvas ones I used. I have a link in my post on the supply list to an Amazon list of blank canvas totes that should work. It’s been a few years since I made these and I’m not sure of the size. Thanks so much for your visit! You see I find my way to your blog even when I’m not trying. (I found this post through a link party.) These are so pretty. I love what you did with the stencils. they could easily go for a lot of money if sold in a store. Thanks Mary! How funny. 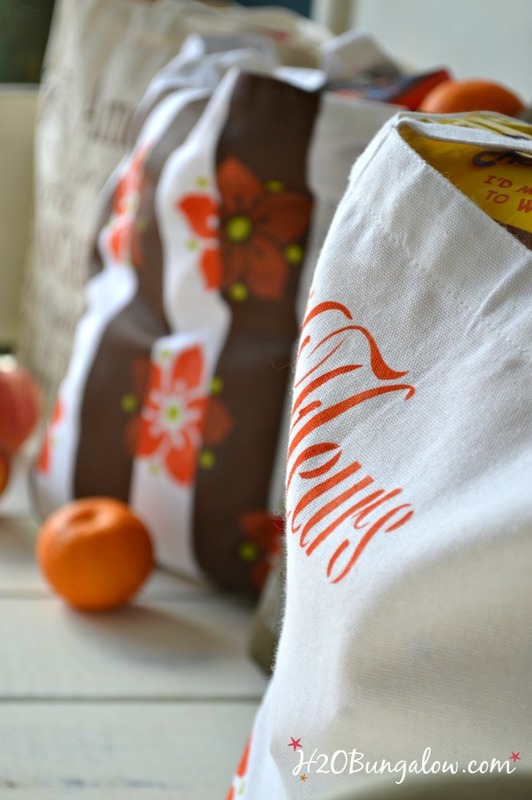 I love these fabric market bags, they are so heavy duty and wash well. I can carry twice as much in each one over the plastic bags too. Thanks so much for stopping by! Cute Idea Love them more than those store logo ones! Thanks for linking up to Merry Monday! Sharing on Twitter tomorrow! Have a great week! Thanks so much Kim! I love these bags and they wash really well too! I love it! I would love it if you would share at my new link party: craftymomsshare.blogspot.com/2015/10/sew-sweet-creatures-crafty-weekends.html. Have a great day!! Thank you so much, I love these bags and use them all the time:) I’ll do my best to make it to your link party! Have a great week and thanks for your visit. I love these bags, they are so sweet. Great job friend. Wendi, these are adorable! I want my reusable bags to be this cute! Thanks DeDe. It’s so much more fun to carry cute bags then the flimsy ones I used to have. These will last a really long time even after washing! Thanks for your visit! Love these! They are both attractive and functional. I’m sure that you’ll use your set for years to come. Cute bags Wendi! I love your color palette and patterns. The paint works so well on this project. Thanks for sharing! They are all fabulous! Love the striped one. My favorite is the one with the brown stripes! What a great idea and so practical and pretty! Love your shopping bags Wendi! I can’t pick a favorite because I like them all equally. Okay, the one with the brown stripes is jumping out at me the most. LOL This post is rather timely because on my To Do List this afternoon is painting fabric with DecoArt Multi-surface paint. I can see from your bags that the color saturation is awesome.